Published by: D. P. Ives, Boston and S. B. Ives, Salem, Mass. 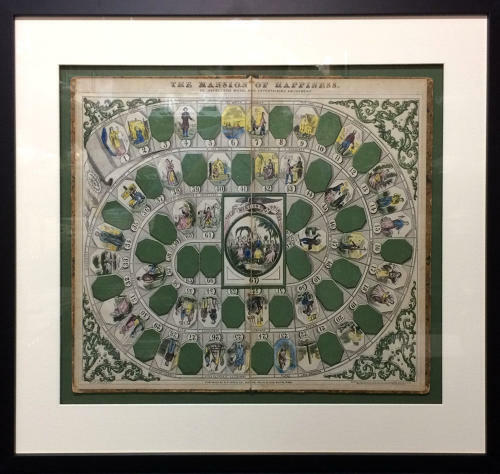 This original hand colored antique game board is professionally framed in a black matte frame with conservation clear glass and recessed matting and measures measuring 25 1/4 inches x 21 5/8 inches. This rare and historically important game board is considered to be the first commercially published game board in the US. The game was made for young adults as a lesson in moral conduct. Christian deeds and virtue were assurances of success and happiness. The players move along the road to eternal happiness. Very good condition as shown in the photos for this important and rare piece. Colors are still very bright. Displays beautifully, a work of classic lithographed mid 19th century art.